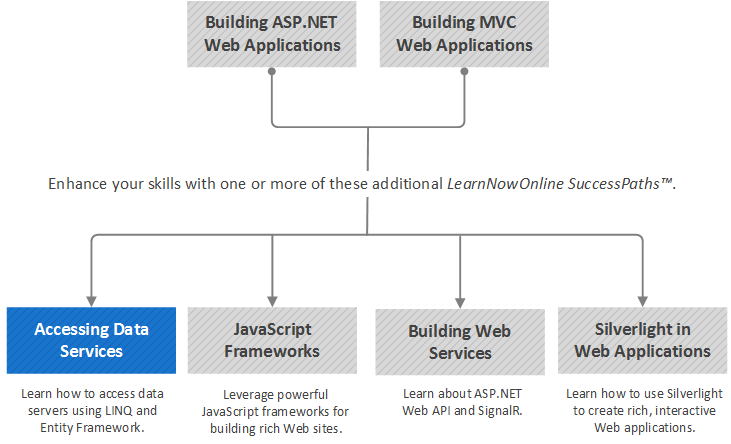 You should have completed our Building ASP.NET Web Applications or Building MVC Web Applications paths, or have equivalent knowledge and experience. In this path you will dig deeper into accessing data from a Web application. You will leverage two key technologies in the .NET Framework: Language Integrated Query (LINQ) and the Entity Framework. You will begin by learning to use LINQ to easily create complex data-independent queries. In addition, you will learn about the language features for Visual C# in Visual Studio in order to make LINQ possible. You will work through a quick overview of LINQ, and how it applies to working with collections of objects, retrieving data stored in SQL Server, and creating XML content. You will also be introduced to new LINQ-oriented language features: LINQ to Objects, LINQ to DataSets, LINQ to SQL, LINQ to XML, and LINQ to Entities. You will then move on to Entity Framework and will learn some of the basics of object relational mapping systems and how they overcome some of the problems when working with relational data in an object-based application. You will see how entity objects are a big improvement over generic data objects, such as the data set and the data tables provided by ADO.NET. Then you will learn specifically about the Entity Framework, Microsoft's ORM technology, and why it is a compelling data access technology in the .NET development space. You will discover some of the ways to create data models using the tools provided with Entity Framework and SQL Server Data Tools in Visual Studio. You will explore the XML that makes up the three Entity Data models--conceptual, storage and mapping--so that you have a good understanding of how Entity Framework implements many of its features. Finally you will see how you can customize an entity data model to make it easier for application developers to use its entity objects.